Oops - we don't appear to have a video for the can Pro 5. Perfect integration and advanced document management with cloud platforms and integrated DMS:MS SharePoint,Therefore,Dropbox,etc. Scanning of notes,contracts,letters,correspondence,and more,directly into PDF or MS Office format. Ideal for duplex scanning of ID cards,insurance cards/Carte Vitale,and all other laminated cards (designated slot). Option of configuring up to 9 smart tasks associated with the scanner's buttons (scan to PDF,scan to Dropbox,FTP,etc.). Perfect integration and advanced document management with cloud platforms and integrated DMS:MS SharePoint,Therefore,Dropbox,etc. Scanning of notes,contracts,letters,correspondence,and more,directly into PDF or MS Office format. 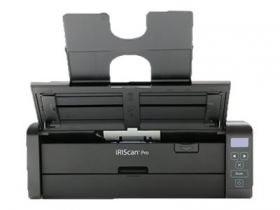 Ideal for duplex scanning of ID cards,insurance cards/Carte Vitale,and all other laminated cards (designated slot). One-step scanning and exporting of business cards (10 cards at a time) to MS Outlook,Salesforce,and Microsoft Dynamics CRM. Quick and accurate scanning of your invoices and receipts ("Long-paper"mode:up to 3m/118") for efficient expense management.